TAWAU: More than 8,000 consumers in Bandar Sri Indah (BSI), here have been putting up with irregular water supply in the past 10 years which affected their most basic daily chores. However for them it was the last straw on the camel’s back when their taps run dry for 10 days since last week. BSI Phase One Rukun Tetangga chairman Yusri Yumasa said BSI residents have patiently struggling with their plight but they cannot tolerate water supply disruption for up to 10 days in a row. “The hot and dry weather should not be an excuse as the parties responsible should have contingency plans when the weather was forecasted, why didn’t the developer or Water Department solve our problem, do not wait until we residents are enraged before sending water,” he told reporters. 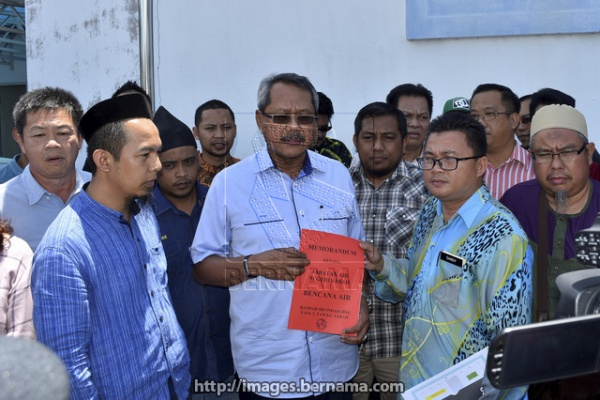 Yusri and 50 BSI residents went to Tawau Water Department Thursday to hand over a memorandum signed by BSI residents over the extreme water crisis in BSI. The BSI memorandum presented by Balung assemblyman Datuk Osman Jamal to Tawau Water Division engineer, Asabri Robensen for Sabah Water Department. In this regard, Yusri also hoped water from Balung Water Treatment Plant could be channeled to BSI as it has been 10 days since BSI was without water supply. “If the water disruption continues for 24 hours, we will be holding another demonstration according to regulations, we do not want to trouble anyone, we only want our basic needs protected,” he said. In this regard, another BSI Phase Three resident, Gan Chee Chan wants the the party responsible to find an initiative to settle the critical water problem. Among others the memorandum also wanted the construction of the Tawau Dam in Gudang Empat expedited to resolve the water crisis in Tawau. Meanwhile, Osman said after the discussion with Tawau Water Department, it was decided the Balung Water Treatment Plant would supply water to BSI. “Currently, the water supply at BSI is only from the North Water Treatment Plant and we hope with two channels today or tomorrow, BSI will start to obtain clean water,” he said and added that water from Cinta Mata Water Treatment Plant will also be temporarily channeled to BSI. 8,000 fume over 10 days of dry tap 0 out of 5 based on 0 ratings. 0 user reviews.